Following the First World War, the perceived inadequacies of the peace settlement were a major contributing factor to political turmoil in Italy. Coining the phrase ‘mutilated victory’, the acclaimed poet, politician and soldier Gabriele D’Annunzio (1863–1938) emerged as the high priest of Italian irredentism. Acting on his grievances, he formed a private army, which in September 1919 annexed the disputed Adriatic port of Fiume on behalf of Italy. In so doing, D’Annunzio hoped to inspire a general purification of Italian politics and society. Yet when the fire ignited at Fiume failed to spread to Italy proper, he and his followers found themselves in an isolated position. In response to this setback, D’Annunzio now declared himself Commandante of a rogue statelet—the so-called Regency of Carnaro—that posed as a centre for international revolution. This development was born from D’Annunzio’s conviction that Italy was something of a ‘proletarian power’ whose destiny was to represent the interests of the young, emerging nations of the post-war era. He therefore portrayed his Fiuman adventure as part of a larger contest between the ‘Western plutocracies’ and the exploited peoples of the world. D’Annunzian Fiume thus became an attractive destination for a curious mix of political extremists. Of this influx, one man in particular, Giuseppe Giulietti, helped to shape subsequent events. Giulietti was the militant leader of the Italian Maritime Workers’ Union. Inspired by events in Fiume, in October 1919 he commandeered an Italian cargo ship called the Persia. Laden with military equipment, the Persia was en route to Vladivostok in Russia, where she was to resupply the White Armies then fighting Lenin and the Bolsheviks. In protest at the war in Russia, Giulietti and a volunteer crew boarded the ship and diverted her north to Fiume instead. Suitably armed, D’Annunzio was now in a position to canvass support for a Fiuman-based parody of the League of Nations. Portentously called the ‘League of Fiume’, this project was to provide a rallying point for the so-called ‘oppressed nations’ of the world. To further these ambitious plans, the Fiume Command sanctioned a number of diplomatic missions. 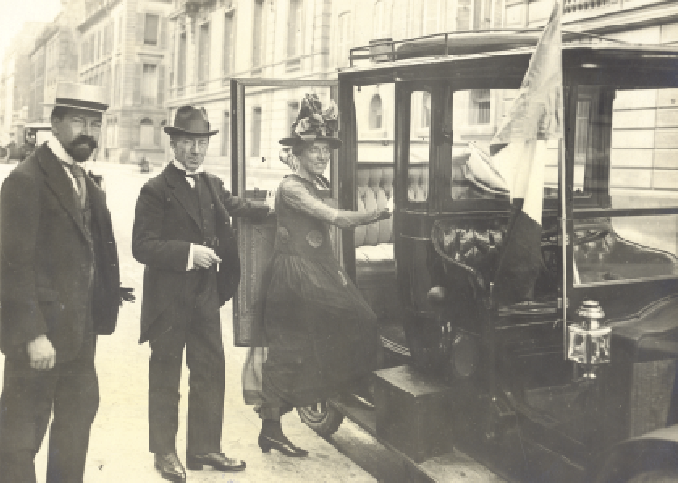 Accordingly, in April 1920 the senior Sinn Féin envoy in Rome, Seán T. O’Kelly, learned that, on the proviso that the Irish Republic signed up to the League of Fiume, D’Annunzio was prepared to provide military assistance to the IRA. Recognising that any public dealings with D’Annunzio could be damaging to Irish interests, this offer presented O’Kelly with something of a dilemma. For one thing, the cornerstone of Fiuman foreign policy was opposition to the expansion of Anglo–American influence. Clearly, the Irish voiced no objection to any organisation opposed to Great Britain. Yet even though President Wilson’s negative attitude towards Irish independence caused resentment at the time, republicans were not prepared to place themselves in opposition to the United States. Moreover, D’Annunzio himself was a notorious philanderer and anti-clericalist whose fondness for irreverence was well known in Ireland. As such, the Dáil government felt disinclined to ally itself with a sworn enemy of the Catholic Church. The hard-pressed IRA, on the other hand, desperately wanted to access the Fiuman arsenal. In consequence, O’Kelly decided on a policy of prevarication. Giving no more than ‘a non-committal answer’ about the League of Fiume, he despatched another Sinn Féin envoy, Dónal Hales, to negotiate with D’Annunzio. A native of Bandon, Co. Cork, Hales’s siblings, Tom, Seán and William, were all leading IRA men. Fully informed about the increasingly severe fighting in Munster, Hales pursued his task with an intensity born of concern for family and friends at home. The rapid demise of the League of Fiume, however, fatally undermined Hales’s mission. Because of his ultra-nationalist past, D’Annunzio was unable to convince the international left of his commitment to the cause of anti-imperialism. In addition, the nefarious behaviour of Egyptian revolutionaries, who, anticipating the Irish strategy, made off with a large portion of the Persia’s rifles before reneging on verbal commitments made to D’Annunzio, caused serious discontent within the Fiume Command. In consequence, the Fiumans were highly protective of their remaining stockpile. Hoarding the balance, they instead concentrated on fomenting revolt in Yugoslavia while at the same time earnestly planning for a future march on Rome. Paris, May 1919—Seán T. O’Kelly (centre) with Mr and Mrs Charles Gavan Duffy on the way to a meeting with Georges Clemenceau. O’Kelly regularly entertained other disaffected diplomats, including representatives from D’Annunzio’s city-state, who had gathered in the French capital. Despite this setback, the plot to acquire Italian arms now took a new twist. 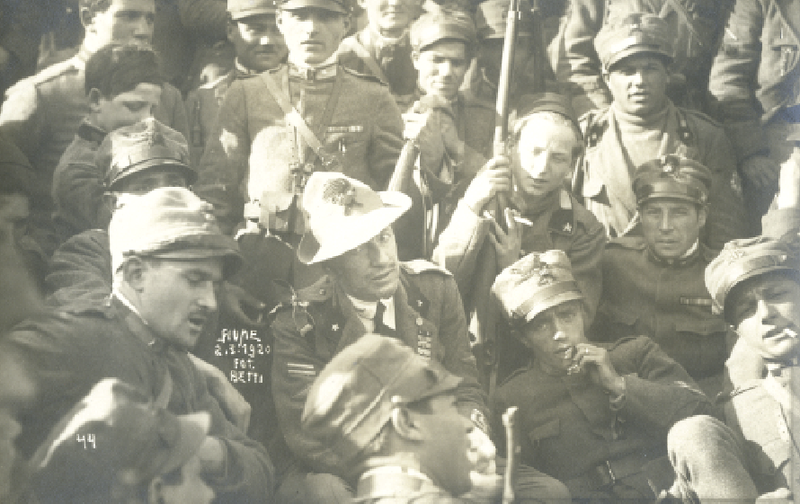 In the late summer of 1920 Hales made contact with a group of regular Italian Army officers. Angered at British ‘duplicity’, they advised Hales that captured Austrian equipment, then abounding in Italian arsenals, could easily be shipped to Ireland under the guise of ‘scrap metal for some Jew in Amsterdam or Oslo’. Via the Anglo-Italian novelist Annie Vivanti, D’Annunzio soon learned of this encounter. Married to a Sinn Féin activist, Vivanti was then performing important propaganda work on behalf of the Irish Republic. As a respected member of the Italian literati, she moved in the same pre-war social circles as D’Annunzio, with whom she forged a strong personal relationship. Suitably exploited by O’Kelly, this connection revived the poet-warrior’s interest in Irish adventures. Flag of the ‘Regency of Carnaro’—unveiled to mark the first anniversary of the annexation, the flag was an original concept by D’Annunzio himself. The colours of Fiume (top left) and Italy (top right) overlook a red field, gold stars and gold serpent, all of which signified revolution and eternity; the Latin inscription reads ‘Who opposes us?’. 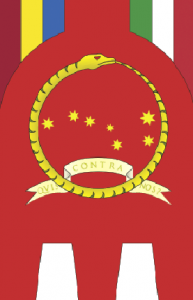 Note the ‘starry plough’ arrangement of the gold stars, reminiscent of the flag of the Irish Citizen Army, possibly an act of homage to James Connolly by D’Annunzio’s lieutenant, Belgian left-wing poet Leon Kochnitzky. To lend speed to this new enterprise, D’Annunzio encouraged the Irish to coordinate their efforts with Benito Mussolini, who, as leader of the nascent Fascist movement, had access to influential elements within the military. Armed with written instructions from D’Annunzio, Vivanti and O’Kelly travelled to meet the future dictator in Milan. Already keenly interested in the Irish Question, Mussolini enthused about the proposed gunrunning venture. Indeed, in a written reply to D’Annunzio, he promised not only to broker a meeting with the military but also to finance any resulting arms shipment to Ireland. Fulfilling the first part of this commitment, Mussolini helped to arrange a meeting at the War Ministry in Rome. Here, on the morning of 21 November 1920—a fateful date in the calendar of the Anglo–Irish struggle, more commonly known as Bloody Sunday—Hales met with a general and a ‘senior civil servant’, whom one source suggests was actually the then minister for war and future prime minister of Italy, Ivanoe Bonomi. This clandestine conference was highly successful from an Irish point of view. Only anxious that Hales and the IRA should find their own way of removing the arms from Italy, for a ‘nominal fee’ the Italians promised to supply 20,000 rifles, 500 machine guns and five million rounds of ammunition. Informed of this outcome, the IRA GHQ initiated plans to land these weapons near Cork Harbour in the spring of 1921. At the time, the Irish in Italy thought nothing other than that they were dealing with corrupt officials who, resentful of the ‘mutilated victory’, saw an opportunity to line their pockets by selling untraceable Austrian weapons. Yet historical hindsight suggests that high politics also contributed to this remarkable affair. 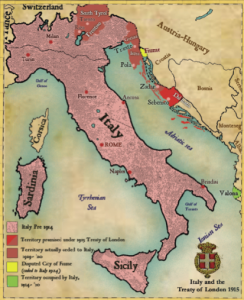 By the winter of 1920, secret negotiations between Rome and Belgrade towards the first Treaty of Rapallo had reached an advanced stage. Under its provisions, Fiume was to become a demilitarised ‘free city’ along the lines of Danzig in Poland. Furthermore, should D’Annunzio object, the Italians agreed to apply force to effect his removal. To forestall this scenario, the chief architect of the Rapallo agreement, who happened to be none other than Ivanoe Bonomi, kept a close counsel with the highly ambitious Mussolini. Notwithstanding his public support for ‘the hero’ in Fiume, the latter feared a D’Annunzian-led coup d’état. Thus Mussolini supported the rapprochement with Belgrade and connived with Bonomi to bribe D’Annunzio into leaving Fiume voluntarily. Considered from this angle, the intrigues on behalf of the IRA appear calculated to pander to D’Annunzio’s wider interests in advance of Rapallo. If so, it is also probable that Bonomi and Mussolini anticipated that, post-Rapallo, the Irish might provide them with lasting relief from their mutual problem. 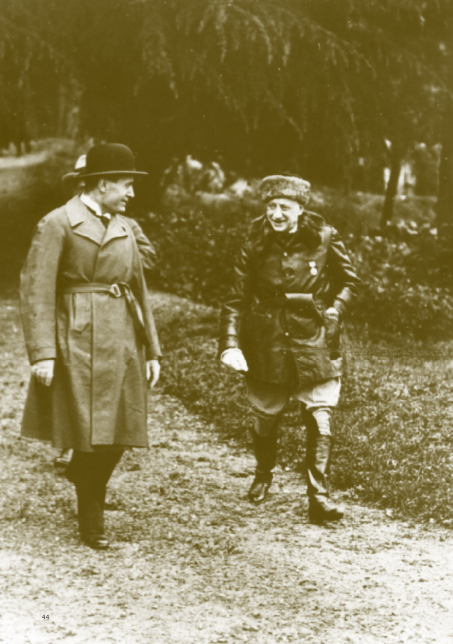 Given that he was a self-proclaimed ‘man of action’ with a thirst for adventure and publicity, there was every possibility that a deflated D’Annunzio might join the gunrunning expedition to Ireland, thereby removing himself from Italy altogether. Subsequent events would appear to support this hypothesis. Unmoved by bribes, D’Annunzio eventually ‘declared war’ on Italy. Hostilities were short-lived, however. A bombardment on Christmas Eve 1920, in which D’Annunzio himself suffered an injury, finally brought his burlesque regime to an ignominious end. Nevertheless, having obtained a largely bloodless victory, the authorities in Rome granted a general amnesty to the defeated garrison. D’Annunzio himself remained in Fiume for some weeks to recuperate, from whence, amidst widespread rumours that he was destined for Ireland or some other troubled part of the British Empire, he retreated to his villa on the shores of Lake Garda. Above: Il Popolo d’Italia, 29 August 1920—in his capacity as editor of the Fascist daily newspaper Benito Mussolini invested heavily in the Irish Question. Courtesy of Irish activists in Italy, he had ready access to republican propaganda. Mussolini’s editorials, which eulogised Sinn Féin at the expense of the British, complemented these reports. Yet these pronouncements were rhetorical and tactical rather than genuine. Reflecting the catch-all intent of early fascism, they appealed simultaneously to Italian anti-imperialists and nationalists who believed that Britain had abandoned Italy at the Paris peace conference. As demonstrated here, grandiose statements on international affairs also sought to create the impression that Mussolini was somehow a ‘statesman in waiting’. In this example he offers an opinion on Terence McSwiney’s hunger strike, Arab revolts in Italian-occupied Libya, the Soviet–Polish War, and the likelihood of a future rapprochement between Russia and Germany. Meanwhile, the republican leadership had selected a Cork officer with seafaring experience, Cmdt Michael Leahy, to travel to Italy. Travelling incognito as a clerical student bound for Rome, Leahy arrived in Genoa in March 1921. On arrival, he learned that Hales and Giuseppe Giulietti had finalised arrangements for removing the arms from Italy. The Maritime Workers’ Union owned a sailing collier named the Stella Maris, which was made available for the enterprise. Normally travelling outbound to Newcastle in ballast, on her next voyage Leahy and an Italian crew planned to sail the ship south to Rome, where she was to take aboard her military cargo. At this point it appears that the only issue preventing the scheme from reaching a successful conclusion was money. By now, the mooted ‘nominal fee’ had been set at the princely sum of £10,000. Mussolini, moreover, had evidently reneged on his previous assurances, and the cost involved gave Dublin serious pause for thought. Nevertheless, indicating that funds would be forthcoming, Dáil Minister for Finance Michael Collins instructed Hales to bide his time until a suitable means of transferring the money to Genoa was found. With the initiative stalled, Hales and Leahy embarked upon an impromptu tour of northern Italy. Travelling in the company of D’Annunzio’s confidants, they first travelled to Milan, where they met with Vivanti and leading Fascists. From there the party travelled onwards to Lake Garda, where D’Annunzio himself entertained them. According to Leahy, D’Annunzio’s men pleaded to be allowed to travel aboard the Stella Maris. In so doing, they revived plans, first mooted in the spring of 1920, to send an expeditionary force to Ireland to fight alongside the IRA. 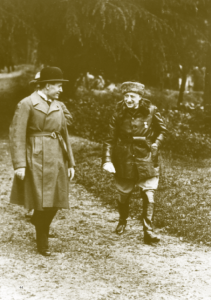 Meanwhile, Department of External Affairs records suggest that D’Annunzio himself was agreeable to reappearing in Ireland as the fêted benefactor of the Republic. According to another senior Sinn Féin diplomat, George Gavan Duffy, the former Commandante felt ‘bitterly disappointed at the king [of Italy] for firing him out of Fiume’ and wanted ‘a new field, and thinks of Ireland, India and Egypt’. Clearly excited by the prospect, Gavan Duffy wanted to secure the issue in Ireland’s favour by approaching D’Annunzio with a written invitation from the Dáil. Unfortunately for D’Annunzio and Gavan Duffy—and one must suspect for Mussolini and the Italian government also—this suggestion was not taken up by a cautious President de Valera. Revealing that he harboured unconventional plans of his own about how best to subvert the British Empire, de Valera instead invited D’Annunzio to try his luck in Soviet Moscow, and from there to march on an unsuspecting India! Tempting though it is to speculate on the matter, the historical record does not reveal whether D’Annunzio felt revitalised or further humbled by de Valera’s fantastic suggestion. Either way, the gunrunning plot collapsed in April 1921. Upon learning that the Royal Navy was keeping a watchful eye out for the Stella Maris, Michael Collins aborted the mission. Exactly how the British uncovered the plot remains something of a mystery. Regardless, in the interests of protecting his own intelligence-gathering operations, Collins instructed Hales to remain tight-lipped about why the Irish had abandoned the enterprise. Hales rigidly observed this instruction until his deposition to the Bureau of Military History in 1953. Thus rumours and innuendo, including tales of cabinet-level treachery, about the failure to procure Italian weapons abounded within the Munster IRA for months and years to come. Mark Phelan teaches history at NUI Galway. L. Hughes-Hallett, The Pike: Gabriele D’Annunzio; poet, seducer and preacher of war (London, 2013). M. Ledeen, The First Duce: D’Annunzio at Fiume (London & Baltimore, 1977). J. Woodhouse, Gabriele D’Annunzio: defiant archangel (New York, 2001).